'Church & State' and 'Time Stands Still' run in repertory through Oct. 7 at the Raven Performing Arts Theater, 115 North St., Healdsburg. Dates and Times vary. $10–$25. 707.433.6335. raventheater.org. It's just 72 hours till election day, and North Carolina Sen. Charles Whitmore (Matt Farrell) is having a crisis of faith. A recent school shooting in his hometown has led him to question his belief in God and in his usual staunch defense of the Second Amendment. What's worse, he's admitted as much to a reporter (Zack Acevedo). His campaign manager (Katie Watts-Whitaker) is apoplectic. His Bible-quoting, Glock-toting wife (Priscilla Locke) will have none of it. He's about to make the biggest campaign speech of his life. Will he stick to the script? Playwright Jason Odell Williams' Church & State is an interesting 80-minute polemic on the political paralysis that has gripped our nation on this subject. While there's no doubt where Williams and director Steven David Martin stand on the issue of gun control, the play does not reduce those who take a different stand to cartoon figures. It does, however, wrap the debate in a sitcom-like script, albeit one with a jolting and effective climax. Farrell does well as the conflicted senator, though he lacks some gravitas and maturity. Locke is terrific in the haphazardly written role as his wife, and Watts-Whitaker holds her own in scenes between the two. Acevedo plays multiple roles and provides some of the play's lighter moments as a campaign gofer. 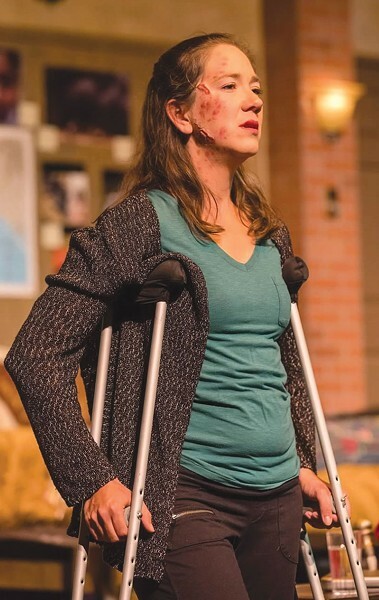 Caitlin Strom-Martin directs a very strong cast in the Donald Margulies–penned Time Stands Still. Maureen O'Neill plays Sarah Goodwin, a photojournalist returning home after being blown up by a roadside bomb in Iraq. She's accompanied by her partner, James (Rusty Thompson), a reporter who had returned stateside earlier after suffering a breakdown from his own war-zone experiences. While Sarah's are more visible, both individuals have scars that run deep. The scabs from those scars are ripped by off by the arrival of Sarah's editor, Richard (Pablo Romero), and his rather young ("There's young, and there's embryonic.") and deceptively lightweight girlfriend, Mandy (Emily Tugaw). Their relationship has James contemplating a less chaotic life while Sarah looks to return to her work. Time may stand still but relationships don't.